"Missouri, Birth Registers, 1847–1910", digital image, Ancestry.com, "Sackett, Thomas Edward, b. 5 Sep 1891 at 213 Victor St, father Thomas b. US, mother A Royer b. US." WWII draft and gravestone have birth date 4 Sep 1891. US Social Security Administration, "Social Security Death Index", database, American Ancestors, "Thomas Sackett, b. Sep 5, 1891, d. Jul, 1968, SSN 490-03-7866 issued MO, residence Saint Louis, Missouri, 63111, county Saint Louis City." US Social Security Administration, "Social Security Death Index", database, American Ancestors, "Mamie Sackett, b. Oct 4, 1889, d. Jan, 1978, SSN 555-21-6037 issued CA, residence South San Francisco, California, 94080, county San Mateo." "Missouri, Marriage Records, 1805–2002", digital image, Ancestry.com, "3 Nov 1934 affidavit for license sworn at St Louis County, MO. Thomas E Sackett, 43, & Betty Jordan, 24. Both of St Louis, MO." Website Missouri Digital Heritage, Missouri Death Certificates, 1910–1966 (https://s1.sos.mo.gov/), "Sackett, Betty Lee, d. St Louis City Hospital, St Louis, MO, 5 Oct 1954, res. 1918a South Broadway, St Louis, married, b. Piedmont, MO, 14 Jan 1900, age 54, father Jasper Babb, mother Mary Black, husband & informant Thomas Sackett, 1918a S Broadway, cause pulmonary infarction, bur. Calvary Cemetery, St Louis, 8 Oct 1954." Website Missouri Digital Heritage, Missouri Death Certificates, 1910–1966 (https://s1.sos.mo.gov/), "Sackett, Ruth M, d. Homer G Phillips [Hospital], St Louis, MO, 31 Jan 1965, res. 4132a N Broadway, St Louis, married, b. Arkansas, 24 Jan 1914, age 51, husband & informant Thomas Sackett, 4132a N. Broadway, father Riddle, mother unk., cause cerebrovascular accident, bur. Calvary Cemetery, St Louis, 4 Feb 1965." [Next door to father Thomas Sackett]. "US City Directories, 1822-1995", digital image, Ancestry.com, St Louis, Missouri, City Directory, 1910, 1913, 1914, "Sackett Thomas jr driver r 1021 Call. "; 1916, "Sackett Thomas driver r 1105A Glasgow av. "; 1917, "Sackett Thomas ydman r 2813 Stoddard. "; 1929, "Sackett Thos lab r4257 Gano av. "; 1931, "Sackett Thos janitor r4257 Gano av." "US, World War I draft registrations records 1917–1918", digital image, Ancestry.com, "No 453/90, Thomas E Sackett, age 26, of 2813 Stoddard St, b. Sept 4 1891, b. St Louis, MO, yardman, employer McKinney B. Co, at St Louis, dependents wife 2 children, no previous military service. Registrant of medium ht, medium build, blue eyes, brown hair, not bald, no disabilities. Reg St Louis, Missouri, June 5/17." Clancy, Blanche, roomer, 26, b. MO, father b. MO, mother b. MO, seamstress, private. 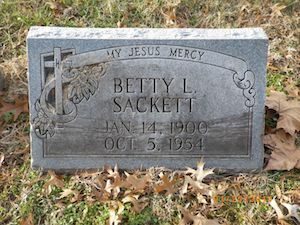 Sackett, Betty, wife, 40, b. MO. Sackett, Edward, son, 30, single, b. MO, bellboy, hotel. "US World War II draft registration cards 1942", digital image, Ancestry.com, "Serial no. 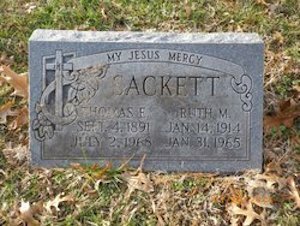 U1979, Thomas Edward Sackett, 2527 West Dodier St, St Louis, MO, age 50, b. St Louis, 4 Sep 1891, contact wife Bettie Lee Sackett, employer J H Farrish Real Estate Co, 713 Chestnut St, St Louis, race white, ht 5' 5½", wt 163, eyes blue, hair brown, complexion light, scar on neck and left thumb, wears glasses, hard of hearing. Reg St Louis City, MO, 26 Apr 1942."